Acclaimed writer, professor, and political commentator Dr. Melissa Harris-Perry opened up this year’s DePauw Dialogue 5.0 with her talk, “What Is Just?” Her speech stressed the value of curiosity and courage in achieving productive discourse. Harris-Perry asked the audience to be vulnerable, emphasizing that we all hurt and are hurt by people. Included in this vulnerability was asking the question, “What truths are missing?” which means piecing together all of the historical and structural truths of stories, especially lived experiences. Some of her presentation slides showed statistics, including the disparity between black and white confidence in law enforcement. Even though the data was “agonizing,” Harris-Perry encouraged audience members to be courageous and analyze it. 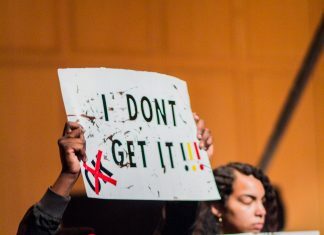 Too often, she said, college campuses advocate for zero tolerance policies against racism and more that never seem to be effective. “I have zero tolerance for zero tolerance policies…You can’t invite people to the table and have a zero tolerance policy. The practice of individualized self-care is frequently advocated when discussing social justice. However, Harris-Perry advised audience members to instead practice what she called “squad-care,” giving the example of double dutch jump rope where everyone learns and thrives together in community. As soon as Harris-Perry’s talk was finished, DePauw students, faculty and staff were at their feet in standing ovation. As the day continued, individuals were able to take her wisdom into smaller discussions with the encouragement that no matter what they tackled, all they needed to begin was courage.